Twenty-year-old aspiring hip-hop artist Deandre Harris moved to Charlottesville, Va., from Suffolk, Va., two years ago for a job opportunity as an instructional assistant in the special education program at a local high school. But nothing could prepare him for what he experienced Saturday afternoon, when he took part in a counterprotest against the Unite the Right white supremacy marches that took place in the city. By now you’ve probably seen a photo of Harris that has gone viral. 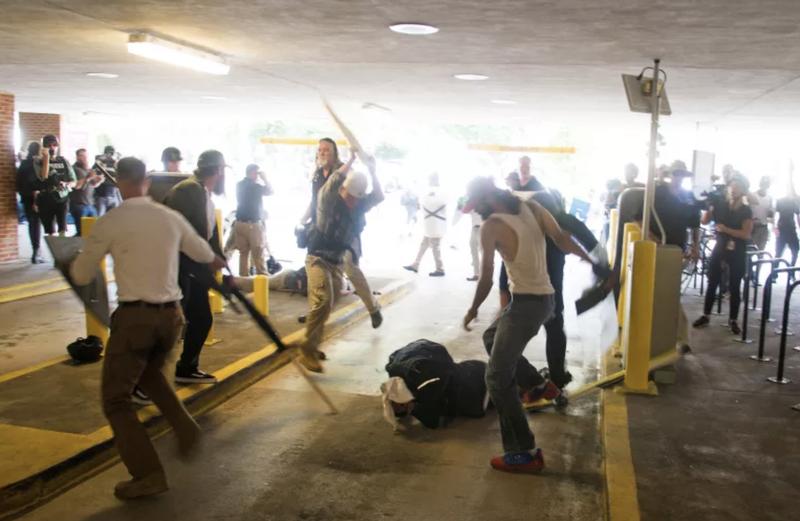 It was captured by Zach D. Roberts and shows Harris being beaten with poles by a group of white supremacists. Harris said if it wasn’t for his friends who noticed him under the pile of white supremacists and helped him, he probably wouldn’t be alive to tell his story. Harris is in the process of pressing charges, and the photographer who took the photo is helping his mother identify the racists who took part in the attack. It’s gone from being cloaked in white masks to crisp Walmart and Target polos, but until those so-called allies stand up to their racist counterparts, nothing will change. People of color are tired. We’ve faced this head-on; it’s now your time to face it and change it.